We are getting excited! 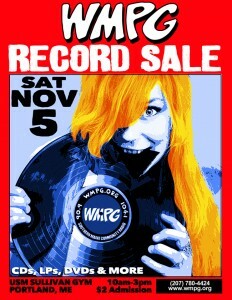 Many of you have donated mucho Vinyl and CDs to the upcoming sale so it should really be exciting! The sale date for 2016 is November 5th! Location is USM Portland Sullivan Gym. 10am – 3pm. Want to read a press release about the sale?Click here! Are you a Record/CD dealer or just have a bunch of records you want to sell at our sale? Click here for more information! To make the sale a success we need your donations! Clear away those Records/CDs/Turntables/Amplifiers and Speakers taking up space! Just give us a call at (207) 780-4424 or e-mail stationmanager@wmpg.org. Our crack team of drivers will quickly arrive at your house to clean away all those old records that are taking up space! We will then give you a receipt which can be used for a tax deduction!